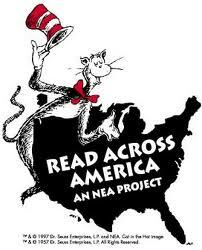 The Fayette County Education Association, the Fayette County Education Support Professionals Association, and the Fayette County Public Schools are sponsoring our tenth annual event called Read Across America to celebrate Dr. Seuss’ birthday and the love of reading on Saturday, March 2, 2019, from 11:00 a.m. to 3:00 p.m. at Fayette Mall in front of Dillard’s. The event features celebrity readers; goodie bags for children which include a Cat in the Hat hat, a book, activity sheets for students, reading lists, and tips for parents; and photo opportunities with the Cat in the Hat, Thing 1, and Thing 2. Four celebrity readers at a time will be reading at half hour intervals. The Cat in the Hat, Thing 1, and Thing 2 will be available for photos all during the event. Disclaimer: Please double check event information with the event organizer as events can be cancelled, details can change after they are added to our calendar, or we can make mistakes.